Coming (very soon) in the next release, a new dataviz. This one is based on "parallel coordinates" graph. Despite this is not the chart you'll see everyday, it's pretty common though. 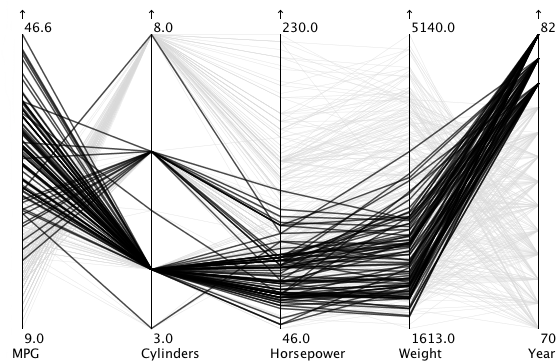 The idea is to visualize various data with various dimensions at the same time. This great blog post explain the concept, and you can read the Wikipedia page if you want to know more. Each vertical line is one of these characteristics. So you can find very quickly in this set the model which is not common and even find one fitting your needs. First thing you can see, there is one VM with a lot of RAM (16G).